These levels have Strong solid-block acrylic vials to provide an accuracy of 0.5mm/m in eight orientations. Every FatMax Pro level comes with a lifetime accuracy warranty. Strong; up to 5 times stronger than other Stanley levels. This is due to the unique reinforced box-beam construction. Dual-machined levelling surfaces ensure maximum accuracy accurate to ± 0.5mm per metre. These levels have been developed and engineered for the rigours of site and construction work, and are used by many different types of tradesmen in challenging environments, from bricklayers to carpenters, kitchen fitters to landscapers and fencers. 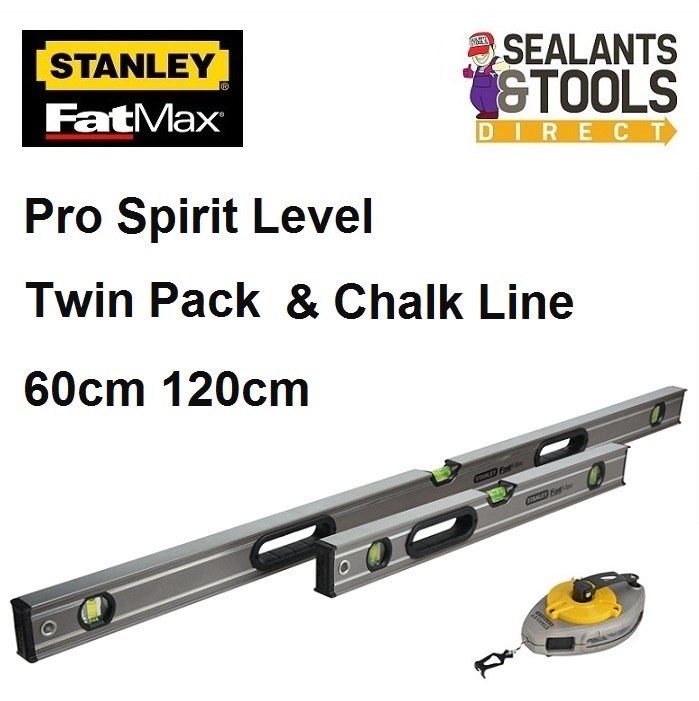 Stanley FatMax Xtreme 30 metre chalk line. Chalk lines are used for marking out for tiling, ceilings, datum lines and similar applications by a wide variety of trades. The line is enclosed in a durable die-cast aluminium housing with a patented chalk view window to see exactly how much chalk is left. Fill the canister with chalk. The hook at the end of the line fixes onto an edge of the item / wall / floor being marked and then the line is pulled taught, held to the surface and then pulled up and released. The line then snaps back to the work piece and leaves a straight chalk line from which you can work to. The line is then reeled in and, as it goes back into the case, is automatically coated and ready for the next time it is required. This high quality chalk line has a release button which allows line extension without handle rotation. It also has a clever rewind system which is geared to enable the line to be reeled in much quicker. This reel rewinds the line 5 times quicker due to the 5:1 gear ratio. Length: 30m - 100 ft.